Protect Our Waters is the City of Seattle’s commitment to take actions and promote partnerships that protect and improve our creeks, lakes, the Duwamish River and Puget Sound. Seattle Public Utilities and King County are building underground stormwater and sewer storage. In the Pacific Northwest, we are fortunate to have some of the best water in the country. Seattle Public Utilities’ (SPU) and King County’s Ship Canal Water Quality Project will help keep it that way. Currently, combined sewer overflows (CSOs) occur along the Ship Canal more than 130 times per year. This joint project is building a tunnel to hold stormwater and sewage during heavy storms. After the storm passes, the stored flows will be pumped to King County’s West Point Treatment Plant. 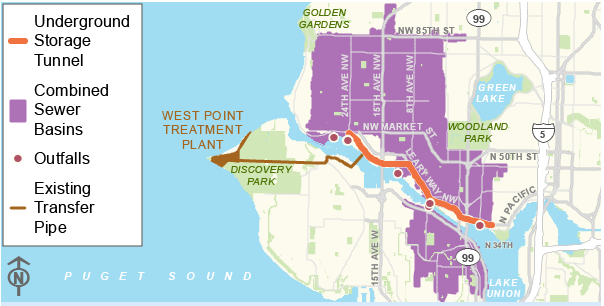 The tunnel will reduce combined sewer overflows (CSOs) into the Lake Washington Ship Canal. The Ship Canal Water Quality Project will improve water quality and is part of SPU’s comprehensive Plan to Protect Seattle’s Waterways. This project will reduce these harmful CSOs. Together, King County and SPU want to make the Puget Sound a safer, healthier—and cleaner—place to live. For more information on this project and its environmental benefits, please see SPU’s Final Supplemental Environmental Impact Statement. The Swale on Yale is an example of Green Stormwater Infrastructure located on Yale Ave North. Seattle is a leader in transforming the way cities think about infrastructure. Green Stormwater Infrastructure (GSI) is a strategy that Seattle Public Utilities (SPU) and King County Wastewater Treatment Division (WTD) have implemented to help manage stormwater in Seattle. GSI works by naturally filtering and absorbing polluted rain runoff through systems like rain gardens, green roofs, cisterns, permeable pavement, and roadside bioretention. 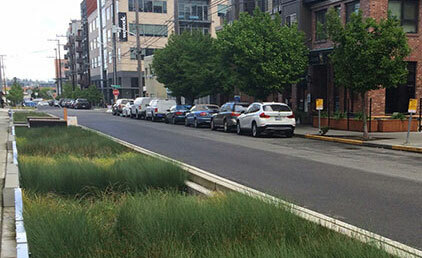 These systems help Seattle manage stormwater as well as bring additional amenities to neighborhoods such as green space, traffic calming, and street trees. In 2013, the City Council and Mayor set a goal for the City to manage 700 million gallons of stormwater annually by 2025 using GSI through agency capital projects, stormwater code related-projects, private innovation, voluntary installations, public-private partnerships, and more. By the start of 2016, SPU and WTD almost doubled the number of gallons of stormwater being managed. Going from 100 million gallons to 192 million gallons. Learn how did we did it in the Green Stormwater Infrastructure 2016 Overview and Accomplishment Report. Seattle’s drainage and wastewater systems in the control center. SPU monitors Seattle’s drainage and wastewater systems 24/7 through a control system called SCADA (Supervisory Control and Data Acquisition). The system monitors the city’s pump stations, rain gauges, surface water and Combined Sewer Overflow (CSO) storage facilities. When something needs to be fixed (for example when a pump jams), SCADA immediately sends an alarm to a control center operator. The control center operator evaluates the SCADA alarm and sends maintenance crews to fix the problem as quickly as possible. 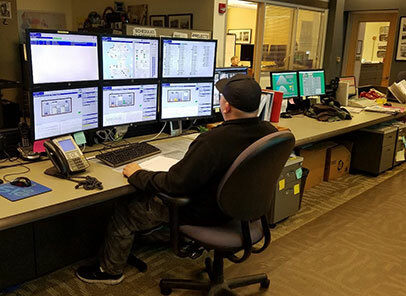 SCADA and the control center operator’s roles are a critical part of protecting Seattle’s public health, public safety, and environment. When our drainage and wastewater systems are operating as intended, it means fewer floods and less pollution entering Seattle’s waterways. Watch this 5-minute video about a young scientist who tests different ways of cleaning dirty water. The North Henderson CSO Reduction Project is complete! Attend a RainWise Workshop in your area to find out how you can get a rebate for a rain garden or cistern.